My initials are: K.S. Perhaps Archipelago Botanicals hopes someone will give me a “K” candle (Key Lime & Neroli) as a present. If that someone wants to impress me even more, why not throw in an “S” candle as well (Sweet Pea & Jasmine)? The Archipelago Botanicals Monogram candle series comes in 24 fragrances — a scent for every letter of the alphabet except “X” and “Z” (sorry about that Xenobia Zarhoff and Zachary Xolo). There is a problem with this monogram idea: the scent that a person finds attractive may not be the “scent” of their initials. Of course, one could simply buy a candle for its smell and ignore the monogram (though that’s hard to do because the monogram is the decorative element on the candle packaging). 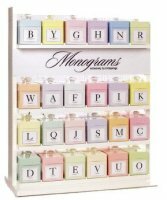 And speaking of the packaging: though many of the fragrances in the Monogram candle series qualify as “masculine” or “unisex,” the design of the pastel-colored candle boxes (topped with crystal knobs) seems aimed toward women. I like the “K” candle with its vibrant lime scent (lime peel and lime juice) and sharp neroli. This is a perfect “cool” candle for warm weather — its aroma is refreshing (and unisex). The “S” candle is too feminine for my tastes — it smells of soft water lily and powdery gardenia; there is not even a hint of the honeyed richness of fragrant sweet peas. Both candle aromas are powerful and produce minimal smoke/soot. The wicks in Archipelago candles are centered — bravo! These days, I’m refusing to buy any candle I cannot examine (cellophane-wrapped boxes? I pass!) because I’ve noticed an infuriating trend in candle production, even in high-end candle brands (including my favorite candle brand of all — Diptyque): the wicks are carelessly placed in the candles. Beware the candle with a wick that is not centered; your candle will not only have an unsightly and uneven burn, but much of its scented wax will not melt — so you are wasting money. Archipelago’s Monogram candles are hand poured and made of soy-blend wax; they use lead-free, double-cotton wicks and come in a reusable presentation box topped with a crystal knob. The 11 oz. candles burn for approximately 60 hours and cost $25. Archipelago Botanicals produces a wide selection of candles and bath and body products. They are available at xanadus, maxalo, scentsandsprays, wrapables, candledelirium and electricladyland. Perhaps AB has figured out that a large percentage of candle sales are related to gift-giving, and the initials are a default method for prompting shoppers to choose from amongst these–and selling TWO candles at that. Gimmicks = gross receipts. At first glance, I thought the display looked like a keyboard. QWERTY, anyone? Tell me K, what D scents do they offer? PS: two of these I also liked: Eucalyptus and Sweet Basil and Yucca Blossom and Grapefruit…both good for warm weather use if you can bear to burn a candle in hot weather (I can't).